Today's blog post provides a bit more information on a couple of items that I have just mentioned in passing. Supergee (aka Arthur Hlavaty) a noted science fiction fan and Robert Anton Wilson expert, will be one of the guests of honor at Detcon 1, a NASFiC being held July 17-20 2014 in Detroit. Mr. Hlavaty is, as he points out in a comment a couple of postings ago, the third head in a triad attraction; the official announcement on the Detcon1 home page lists "Bernadette Bosky, Arthur D. Hlavaty and Kevin J. Maroney," explaining, "A long-term triad marriage, combining fan, academic, and pro activity in F/SF." There are biographies of the trio if you click on this link; Mr. Maroney is the publisher of the New York Review of Science Fiction, and as I've noted, you may download the 300th anniversary issue for free. Mr. Hlavaty, the guy on the right in the red shirt if you check out the official Detcon1 portrait that I've posted with this item, is a very prominent fan writer nominated multiple times for the Best Fan Writer Hugo Award. But let's pursue the "local angle" for a moment: He is a big fan/scholar of Robert Anton Wilson. In the olden days, i.e. before the Internet, the way in fandom to pursue a group discussion on a topic was to found an apa. Arthur founded The Golden APA in 1979, and both Robert Shea and Robert Anton Wilson were contributors. My interview with Arthur about the Golden APA is here. Arthur's review of The Illuminati Papers (dated, but still interesting, he says) is here. 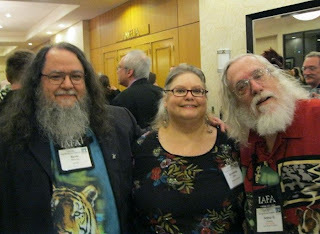 A NASFiC (or "North American Science Fiction Convention") is held in the years when the worldcon is overseas; as I understand it, it is meant to provide a big convention for folks who normally would attend a Worldcon but are not rich enough to journey to Australia, the United Kingdom, Japan or wherever. Next year's worldcon will be in London, so hence Detcon1. About the above photo: I only met Kevin Maroney in person because years ago, I visited my old friend Brett Cox in North Carolina, before he obtained his Ph.D. and became an English professor (he's now at Norwich University in Vermont). Brett gave me a tour of local bookstores (this is what you do when the book nerd is visiting) and I met Kevin at the science fiction bookstore where he worked in North Carolina's Triangle area. In one of those wonderful coincidences, if you look closely at the above picture, you can see Brett's head, in between Kevin and Bernadette. The photo was taken at the International Conference of the Fantastic in the Arts. The Detcon1 announcement and even the Hugo Awards are not the biggest science fiction news of the last few days; the biggest would be the death of science fiction writer, editor, fan and memoirist Frederick Pohl. For my attempt to explain why Pohl was perhaps the most remarkable success story in the field, go here. That should be International Conference of the Fantastic in the Arts.